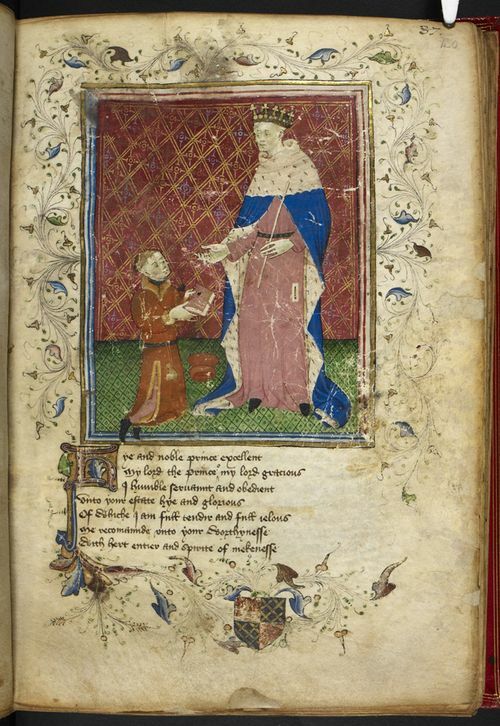 This miniature from British Library MS Royal 17.D.vi, f. 40r, depicts Thomas Hoccleve presenting a copy of the Regiment to King Henry V.
Thomas Hoccleve was the first poet to promote the notion that the English literary canon begins with Geoffrey Chaucer, and he notably does so in his poem known as the Regiment of Princes. Written in 1411 for the rising Prince Henry (soon to be Henry V) purportedly to advise him on matters of good governance, this longest and most popular of Hoccleve’s works presents one of medieval England’s most sustained inquiries into the relationship between a sovereign and his subjects and the nature of literary authority. It also survives in more manuscripts than all but four other works of Middle English verse. Despite its significant presence in fifteenth-century English literary culture, however, only three print editions of the Regiment have ever been produced and only one since the nineteenth century. Additionally, none of these editions are fully critical (i.e. none record in an apparatus of notes all of the textual variations in the poem’s manuscript corpus), making it nearly impossible for scholars to reconstruct how medieval readers encountered this poem in their own times. The most recent edition, edited by Charles Blyth and published in 1999, began as a critical edition in the mid-1980s involving a team of six editors. Due to various extenuating circumstances involving the research and teaching priorities of the team members, however, all but Blyth had to leave the project before its completion, and it was recast as a simpler student edition. While this edition is very good at making the poem accessible to a student audience, it has limited usefulness for scholarship and for illustrating the extensive manuscript history of the text. Rather than reflecting the form of the poem in its 43 surviving manuscripts, it only collates the variants in two. It also significantly emends the text according to hypotheses about Hoccleve’s “intended” spelling and other orthographic choices using a computer-generated concordance of Hoccleve’s Lexicon based on three surviving holograph manuscripts. Although manuscript variation data is not presented in this student edition of the poem, Dr. Blyth and the original team of editors painstakingly collected and compiled this data over the course of two decades. Since the publication of the edition, however, this data has been stored away in Blyth’s files unseen and unused by scholars. In a famous statement Blyth made in a 1996 essay on his editorial process, he defended the exclusion of the variation data from the edition by claiming that the data only would be of value to a small number of scholars and would unnecessarily burden student readers. He then generously offered to provide access to the data to anyone who needed it. Since Lang’s dissertation research depended heavily on the manuscript history of Hoccleve’s works, Lang took Blyth up on his offer in 2009. 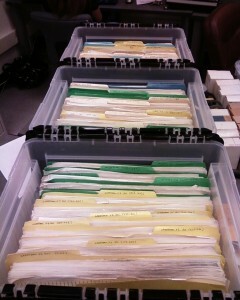 At that time Blyth, who was semi-retired, allowed Lang to take over the stewardship of his files. Through the course of working with the variation data, however, Lang came to dispute Blyth’s implication that it would be of little value to students and researchers. The data consists of full handwritten transcriptions of every single manuscript of the poem (collated by line) and microfilm facsimiles of all but three of these manuscripts. Essentially, this is almost all the archival research one would need in order to produce a critical edition of the poem. By offering general access to this material, we hope to provide scholar-teachers of literature an organized and visually dynamic platform for teaching students about Hoccleve’s poem, Hoccleve himself, and the nature of medieval manuscript publication. Currently we are beginning an initiative to open up the process of constructing a critical edition from this data to include non-specialists and students along with Middle English and Hoccleve experts. Our first step is to transcribe the Collation Tables using the software platform, FromThePage. We hope that this project can provide teacher-scholars of Middle English with a teaching laboratory for exploring how scholars attempt to make sense of the characteristic variability in medieval texts. 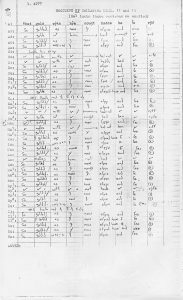 The over-6,000 pages of Manuscript Collation Tables in Blyth’s original files have been scanned and archived with metadata on a permanent site at the University of Texas Digital Repository (Texas Scholarworks). Each of the pages is stored as a greyscale 300 dpi JPG file with a unique name indicating the line number of the poem it represents. When pages have supplemental notes on their reverse sides by the original editors, or when collations of long marginal glosses extend across multiple pages, these addenda are still filed under their associated line numbers and distinguished with additional information in their filenames. 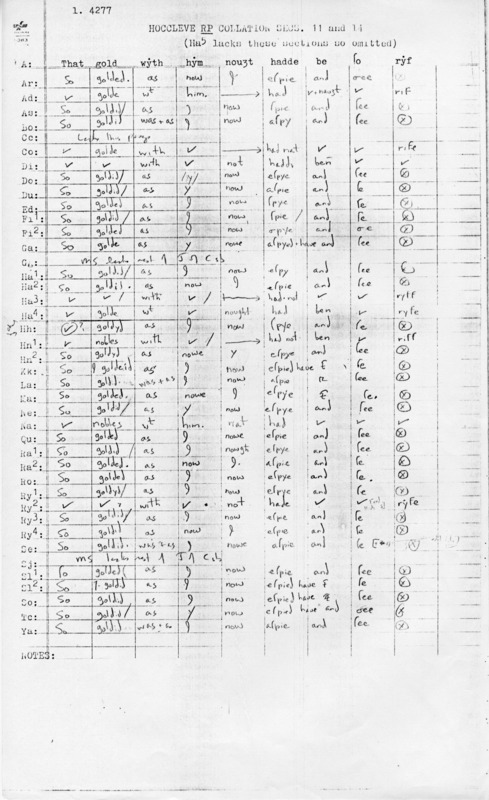 On this page, the standard siglum for each manuscript is listed in the left most column. * The line number and other identifying information is written at the top. In the top row on the page is the line as it appears in the copy text used by Charles Blyth and the original team of editors (British Library MS Arundel 38–one of the earliest known manuscripts of the poem). Each row records how each subsequent manuscript represents the line differently from the copy text, word by word. Please visit the demo sites described in our legacy Digital Editing Portal project pages to explore how the Variant Collation Tables like this can be linked to their associated lines in the poem via a multimodal reading interface that includes images of the manuscripts from which they were derived. The Variant Tables are also accessible for browsing directly on the Texas ScholarWorks website. Please also visit our Collaborative Transcription project page to find links to information that will help you begin working with our FromThePage site. * Here is a key to these MSsigla_Key, drawn from D.C. Greetham’s, “Challenges of Theory and Practice in the Editing of Hoccleve’s Regement of Princes,” in Manuscripts and Texts: Editorial Problems in Later Middle English Literature,ed. Derek Pearsall (Cambridge: D. S. Brewer, 1987), pp. 60-86. The physical property that supports the archive consists of 3 file boxes (51 folders) filled with approximately 6,000 legal sized sheets of paper (and ~200 letter-sized sheets) containing photocopied or mimeographed tables. Each table contains handwritten transcriptions–generally in pencil–of the appearance of a line of the Regiment of Princes (or a gloss) in all extant manuscripts. Each line is compared to the copy text ‘A’ manuscript, i.e. Arundel 38. 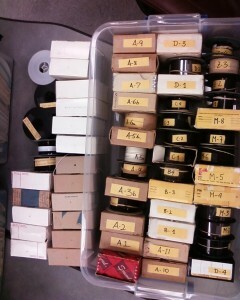 Also among the physical property in the archive, formerly from the personal archive of Charles Blyth, are 42 microfilms containing Hoccleve Manuscripts (catalogued here by Elizabeth Kempf), and 22 uncatalogued microfilms. A cursory survey of the uncatalogued microfilms reveals that they contain manuscripts of Hoccleve’s sources, possible other large works that reveal his hand at work, and manuscripts of contemporary interest (like the Ellesmere Chaucer). All items in the physical collection are currently held by Elon Lang, the Hoccleve Archive General Editor, in Austin, Texas. Just as Charles Blyth did before him, Elon extends an open invitation to interested Hoccleve scholars to come and examine any of this material if the online Archive proves in any way insufficient. One of the motivating goals of the Hoccleve Archive as a whole has been to preserve and publish the hard-copy manuscript collation data compiled for Charles Blyth’s edition of the Regiment of Princes. Preservation will entail scanning this data, which is organized into tables, into image files and then publishing these files online in a meaningful context that can eventually be used as raw material for a Variorum edition and editing exercises. This context will be established by linking each variant table image to its correlating line of the poem and providing a platform by which to crowdsource transcriptions of the tables and build a database of the results. Currently we are betatesting a template in FromThePage here! Each table will linked to images of the medieval manuscript pages from which they were derived and . See M.C. Seymour, “The Manuscripts of Hoccleve’s Regiment of Princes”Edinburgh Bibliographical Society Transactions 4.7 (1974): 255. The four more numerous surviving verse texts are Richard Rolle’s Prick of Conscience, Geoffrey Chaucer’s Canterbury Tales, William Langland’s Piers Plowman, and John Gower’sConfessio Amantis. The original Regiment of Princes editiorial team was led by M.C. Seymour and David C. Greetham. The edition produced by Blyth is available both in print and online at http://www.lib.rochester.edu/camelot/teams/hoccfrm.htm. These hypotheses are derived from computer-aided examinations of three manuscripts of Hoccleve’s other poems that survive in his own handwriting. While the emendations in the edition present convincing reconstructions of Hoccleve’s probable language use, they undeniably make the edition a speculation about the nature of the authorial version of the text rather than a presentation of existing textual evidence. See Charles Blyth, “Introduction,” Thomas Hoccleve: The Regiment of Princes (Kalamazoo: TEAMS, 1999), 17-26 and “Editing the Regiment of Princes,” inEssays on Thomas Hoccleve, ed. Catherine Batt (London: Centre for Medieval and Renaissance Studies, Queen Mary and Westfield College, University of London, 1996), 16-21; D.C. Greetham, “Normalisation of Accidentals in Middle English Texts: The Paradox of Thomas Hoccleve” Studies in Bibliography 38 (1985): 121-151, and “Challenges of Theory and Practice in the Editing of Hoccleve’s Regement of Princes,” in Manuscripts and Texts: Editorial Problems in Later Middle English Literature: Essays from 1985 Conference at the University of York, ed. Derek Pearsall (Cambridge: D.S. Brewer, 1987), 60-86.